NEW YORK (WTVD) -- The ESPYS air tonight at 8 p.m. on ABC11. 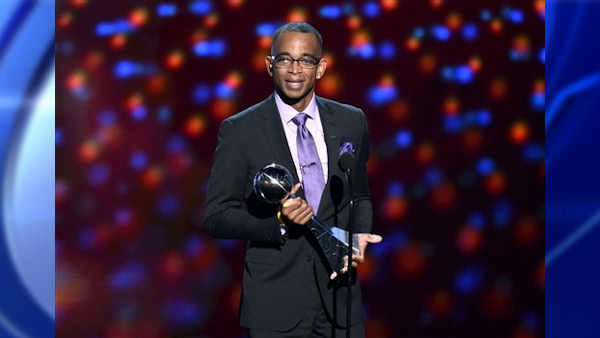 Here's a moment from last year's presentation featuring the late Stuart Scott, a UNC graduate and former ABC11 intern. Scott's daughters, Taelor and Sydni, paid a visit to the Los Angeles mural dedicated to their father, while in town for The ESPY Awards. On July 16, 2014, Scott accepted the Jimmy V Perseverance Award at the ESPYs. During his speech, he expressed the following sentiment about his two daughters: "Taelor and Sydni, I love you guys more than I will ever be able to express. You two are my heartbeat. I am standing on this stage here tonight because of you." During his ESPY speech, Scott shared his approach to fighting cancer. "I also realized something else recently," he said. "I said, I'm not losing. I'm still here. I'm fighting. I'm not losing. But I've got to amend that. When you die, that does not mean that you lose to cancer. You beat cancer by how you live, why you live, and the manner in which you live. So live. Live. Fight like hell."